Ancient sources such as Aristotle discussed property legislation from around 4BC. Spartan women could be bequeathed property upon the deaths of either their husbands or fathers, and were at one point said to own two-fifths of all Spartan land. This was not the case in other Greek states where property ownership transferred to a woman’s male next of kin. Sparta’s social structure saw women managing matters outside the Army, primarily because they were left on their own to do so. The male population trained in the military from aged 7, could fight from aged 19, but they occupied a male-orientated environment until aged 30. They emerged ready to marry women who were at least 18 years old. Both male and female offspring were nurtured in terms of physical development as it was believed that well-developed women would produce strong and robust boys – bred for fighting! 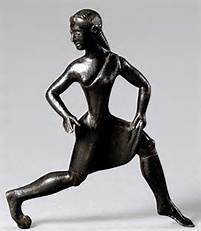 There is evidence from Plutarch that Spartan girls participated with boys in Athletics as part of this development process. Girls were also educated and learned music and dance alongside their male counterparts. This was not the case in other city-states where female betterment was basically non-existent. Spartan women had little power where policy-making was concerned but they played a large part in ensuring the rules made by Ephors (the group of Spartan elders who determined Spartan policy) were carried out; upholding the Spartan ethos of breeding elite male soldiers. While a sole focus on the military prowess of male Spartans in all its forms (from birth to death) existed, it was this same system (linked with the power to own property) that created a social structure allowing the women to gain knowledge and skills. This enabled them to interact with more freedom and power in their lives, greatly increasing their status within their own city state and compared with that of women of other Greek states.